Canada’s remote Yukon Territory is synonymous for many people with adventure and exploration. Located in the country’s northwest corner, it offers the opportunity to escape the rigid structure of everyday life—and to embrace the freedom and simplicity of the wild instead. Historically, life in the Yukon has been sustained by its network of rivers. These fast-flowing waterways provide food, water and a method of transport in a land largely devoid of traditional roads. Today, canoe trips along these rivers are one of the best ways of experiencing the Yukon’s history and landscapes firsthand. There are many different routes to choose from, depending on your budget, your experience levels and the time that you have to spare. In this article, we look at what it’s like to travel along the Teslin and Yukon rivers from Johnson’s Crossing to Carmacks. This spectacular route runs for 230 miles/370 kilometers between Johnson’s Crossing, a small settlement at the headwaters of the Teslin River; and Carmacks, a historic trading post on the famous Yukon River. With no real whitewater, it’s an excellent option for inexperienced canoeists. As long as you pay attention, the chances of capsizing are small—a bonus, considering the freezing water temperatures and the fact that all of your food, clothing and camping equipment is carried in the canoe with you. There is no fixed schedule for this route, but a nine-day/eight-night trip with a company like Yukon Wild allows enough time for regular stops and leisurely afternoons in camp. The first five days are spent on the Teslin River, a quiet, peaceful waterway with abundant wildlife and very few (if any) other paddlers. On the fifth day, the Teslin reaches its confluence with the mighty Yukon River, near the old trading post at Hootalinqua. Here, you’re likely to see more people as well as increased evidence of the region’s human history. Although the route is relatively easy from a technical point of view, it’s important to remember that once you leave Johnson’s Crossing, there is no turning back. Canoeing upstream is impossible, and the wilderness beyond offers no roads, no shops, no cell service and no medical facilities. In an emergency, a helicopter evacuation can be arranged via satellite phone—but in general, all you have to rely on is whatever you bring with you. Although it only became known as the Yukon in 1898, this unparalleled wilderness region has a history that goes back to the earliest human occupation of North America. The original inhabitants of the land were First Nations people like the Tagish, the Tutchone and the Tlingit. In the early 19th century, the first explorers from Europe arrived. These were the fur traders of the Hudson’s Bay Company, and they relied on the First Nations’ superior tracking and trapping skills to harvest the thick pelts of indigenous wildlife. In 1896, gold was discovered in a tributary of the Klondike River, sparking the beginning of the Klondike Gold Rush. The frenzy was short-lived, and all but over by 1899—but in that time, tens of thousands of would-be prospectors arrived in the Yukon to seek their fortune. All of these people left evidence of their Yukon adventures behind, from abandoned gold dredges to dilapidated log cabins now partially reclaimed by the forest. At Hootalinqua, you can see well-preserved settlers’ cabins, a First Nation cemetery and (on nearby Hootalinqua Island) the wreck of the sternwheeler SS Evelyn. The Evelyn was built in 1908, and ferried passengers up and down the Yukon River between Whitehorse and Dawson City. When you’re not on the look out for the route’s historic points of interest, take the time to soak up the Yukon’s natural beauty. For the first two days, the current on the Teslin is almost non-existent. 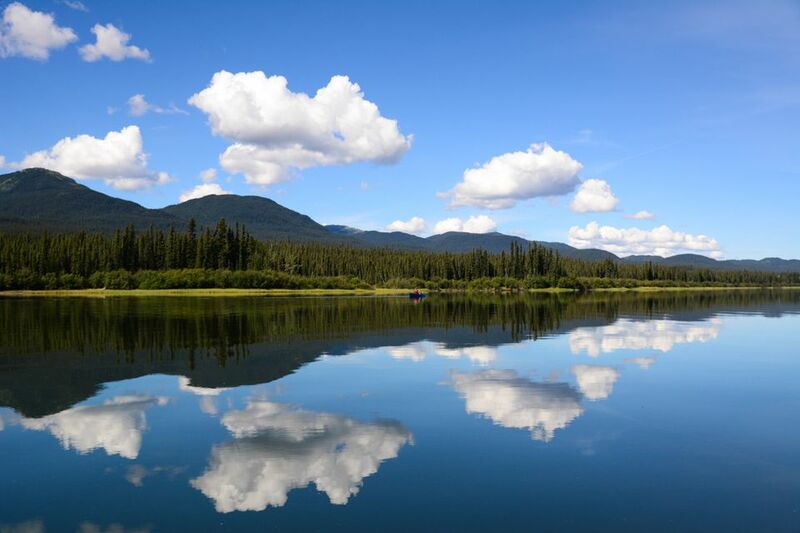 The surface of the river is like glass—and in it, spruce-covered hills and fantastic cloud formations are reflected in a perfect mirror image of the world around you. Later, the river picks up its pace, so that in the last few days, it’s possible to move at a rate of 8.5 mph/14 kmph without even paddling. You’ll pass pebble beaches and slender aspens, and vast tracts of ghost forest burned by previous fires. In some places, the water is so clear that you can gaze through the depths to the reed beds, where Arctic grayling dart in streaks of silver before the shadow of your canoe. The twists and turns of the river are marked by towering cliffs of pale sand-limestone, and in the evening, the golden half-light of the Yukon summer gilds the surface of the river with gold. The sounds of the wilderness are just as captivating—the lonely cry of a loon echoing across the water, or of a squirrel chattering in the forest. At night, owl calls intertwine with the rush of the river, moving past your camp as inevitably as the passage of time. As with any true wilderness, wildlife encounters are possible yet unpredictable. The forests are full of bears and wolves, coyotes and lynx—but whether or not they allow you to catch a glimpse of them is a question of luck. Moose are more frequently spotted drinking at the water’s edge, while Dall’s sheep roam the bare mountains two days out of Carmacks. Keep an eye out for water-dwelling mammals including beavers and otters—especially around the creeks where you will often make camp. Birdlife is abundant, too. The most recognizable avian species is the bald eagle, which can often be seen soaring overhead or perched on branches overhanging the river. Common loons are another highlight with their smart white and black plumage; while flotillas of common merganser flee from the canoes, their webbed feet striking against the surface in a frenzied attempt at flight. Watch for swarms of bank swallows living in colonies in the limestone cutbacks; and belted kingfishers hunting in the quiet backwaters. The campsites along the Teslin/Yukon route have been carved out by generations of explorers, and consist of cleared ground on which to erect your tent—and very little else. You will use a spade to dig toilet facilities in the moss-strewn woods, and your shower is the frigid, fast-flowing river. Meals are cooked over the fire and flavored with woodsmoke (after you’ve used an ax and saw to collect sufficient firewood). Bear safety is important, of course. This means keeping food and toiletries outside your tent, and carrying bear spray wherever you go. After the second night, you’ll find yourself adept in the art of making and breaking camp. It is a way of life that leaves little room for luxury, and yet for many, it is the highlight of a Yukon canoe trip. Without television or cell reception, you have time to bond with your fellow travelers—to follow tracks in the soft sand at the river’s edge, to fish for grayling and pike, or to simply swap stories around the campfire. As countless Yukon explorers before you have discovered, true happiness is found in simplicity. The camps along the route are numerous, and each one is different from the next. If you have a choice, the sites at Mary River, Sheldon Creek and Macauley Bar are amongst the most magical of them all. Late spring to early fall is the only time to plan a Yukon canoe trip—because in winter, the rivers are frozen solid. For the best weather (and the least mosquitoes), the optimum time to travel is late July or early August. You can plan your trip independently, by hiring a canoe and a map of the route from one of several outfitters in Whitehorse, the capital of the Yukon. However, guided trips offer the benefit of an expert with insider knowledge about what to pack, how to cook and set up camp, which campsites are best and how to stay safe. Ask recommended companies Yukon Wild or Bushcraft Yukon for advice.